In the United States, 9.3% of the population is diagnosed with diabetes and it is estimated that an additional 8.1 million people in the country are living with undiagnosed diabetes. Diabetics need to be aware of the oral symptoms of diabetes, and learn how to protect their oral health. There are a lot of ways diabetes can impact oral health, and the best way to prevent those side effects and have a healthy mouth is to keep up with healthy habits and closely manage blood sugar levels. 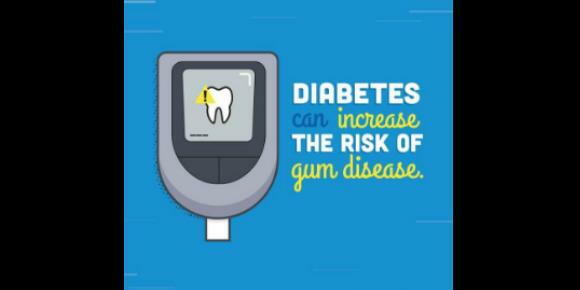 Keeping blood sugar levels healthy helps control a diabetic’s risk of developing gum disease. This is especially important because any infection, including one of the gums, can raise blood glucose levels and further compound a diabetic’s biggest issue. Brushing twice a day and flossing once a day is a tried and tested routine for keeping gums healthy. Even when diabetics notice plaque or buildup on their teeth, a consistent brushing and flossing routine can still prevent gum disease from progressing to its later stage periodontitis. Every diagnosed diabetic should discuss oral care with diabetes to their dentist, and make a point to schedule cleanings and checkups every six months. Diabetics should be aware of a few other common oral health problems. Some medications popular for diabetics to take can cause dry mouth, which leads to sores and cavities. Simply drinking more water or chewing sugarless gum is an easy way to combat this side effect and prevent permanent problems. Diabetics respond differently to infection -- heightened blood sugar levels allow bacteria to grow more rapidly, so it takes longer for the body to fight and work out an infection. Diabetics who also wear dentures are especially susceptible to infections in the mouth like oral thrush, which is caused by fungus. The diabetic body’s response to infection can slow healing from cuts or sores in the mouth, another important reason to stick to an oral care routine that keeps teeth and gums clean consistently. Some diabetics encounter an issue that can be hard to prepare for. Changes in taste buds can cause foods to taste different. In this case, it is important to adjust your diet and try new foods. Some people encounter this problem and add more sugar and sweetness to compensate, but this only leads to more complications for diabetics. Talk to your doctor if you notice a consistent bad taste in your mouth, but adjusting to a healthy diet to manage diabetes will also ensure you can improve your smile and overall health!